You dona��t have any plans for New Yeara��s Eve so far but want to do something special a�� why not experience a different culture and improve your language skills at the same time? Cactus will take you to Madrid for a unique Nochevieja (night of New Yeara��s Eve)! The evening: Most families will start their evening with a copious meal, tapas and wine at a restaurant in the city. Bookings have to be made in advance as restaurants are quickly booked up. 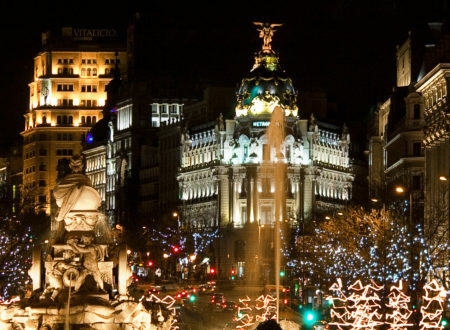 The night: The next meeting point is the Puerta del Sol, the famous square in the centre of Madrid. This is where thousands of people gather to celebrate the remaining hours of the past year. Every year there is a laser show and music which creates a great party atmosphere. The event is also broadcasted on national TV. The last seconds before midnight: When the big clock tower strikes the biggest challenge of the evening begins: during the last 12 seconds before midnight you have to eat 12 grapes (doce uvas) a�� an over a hundred year old tradition which brings you a lot of luck in the new year a�� if you manage to eat all the grapes. At midnight: The sky over Madrid will be lit up by fireworks, people clink glasses and wish each other salud, dinero y amor (health, money and love). But the party doesna��t stop there. The crowd will move on into the clubs and bars and celebrations will go on until the early morning hours. Take one week Spanish language tuition for A?136 with the option of staying with a homestay family which will offer you the chance to experience New Year the traditional Spanish way. Alternatively you can stay in the centre of the city and enjoy the festives in the epicentre of all the action.